I’m going to assume most of the civilised world has taken two-and-a-half-hours out of their week at some point to see Captain America: The Winter Soldier. If you haven’t, might be time to turn off the soap operas and go for a walk. The film does much what the original book (and its subsequent run) did to revitalise Cap in the modern world, presenting an old-world relic with time-appropriate values who gets introduced to the grimier setting of the present. Rather than abject patriotism and a recognisable threat, Cap now contends with murky politics and enemies both within and outside the country he wears as his sigil. I loved the film, based on a book that literally both got me interested in the character and helped form parts of my Honours thesis for my Bachelor’s degree, and it went a long way to reinforce my love of everyone’s favourite Star-Spangled Man. But if Winter Soldier was many steps in the right direction, Loose Nuke takes most of them back, takes a few more, then leaps off the diving board into a pool of frozen disappointment. Fresh from having returned after the harrowing events of Dimension Z, Cap once again finds himself the figurative “man out of time”; twelve years have passed for him in DmZ whilst only a few minutes elapsed for those in the real world. 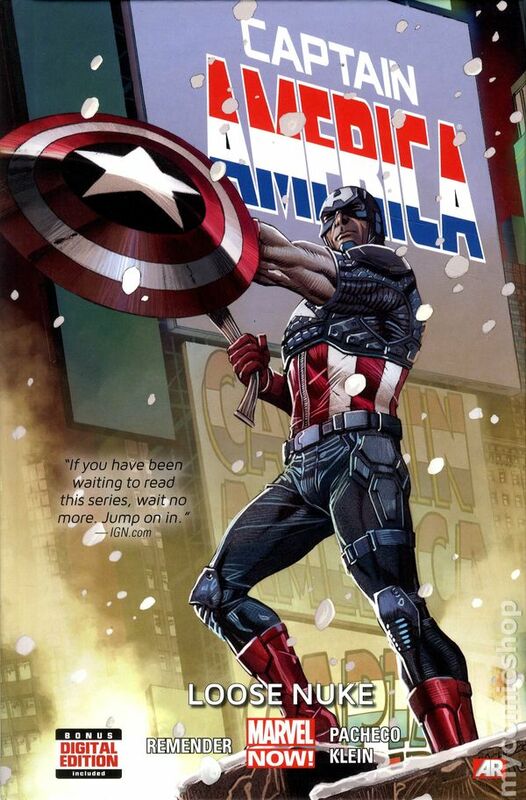 The grittier soldier Cap forged himself into within Dimension Z out of necessity is far removed from the (relatively) more peaceful setting of present-day New York. How can he go back to the life he had here, after already spending years getting over his time as a Capsicle following World War II, when everything seems so radically different after over a decade spent fighting? Apparently the answer is to go Guy Fawkes by starting a bonfire made of your old possessions and try to start anew. If only all problems could be solved with such finality; I would imagine the night air would blaze with the smell of burning credit cards. Believe it or not, the above summary only covers the first chapter of Loose Nuke; a story built around that concept could be an introspective interrogation of both Cap and his place in the world, potentially from a slightly new angle. I’d’ve been much happier with that than what I was slapped in the face with instead. Y’see, there’s a new enemy (or, rather, an old one, but I’ll get to that in a bit) running around Russia with the American flag tattooed on his face. He’s called Nuke, he has a best friend on his arm called Minigun who he never leaves the house without, and he’s fighting “for our boys”; that is, taking down them pesky Red commies because ‘MURICA, Y’ALL. Ok, maybe I’m being a bit harsh. Loose Nuke isn’t a bad book the way Thunderbolts was a bad book, but it’s definitely several steps below the decent work writer Rick Remender did with the Dimension Z saga. 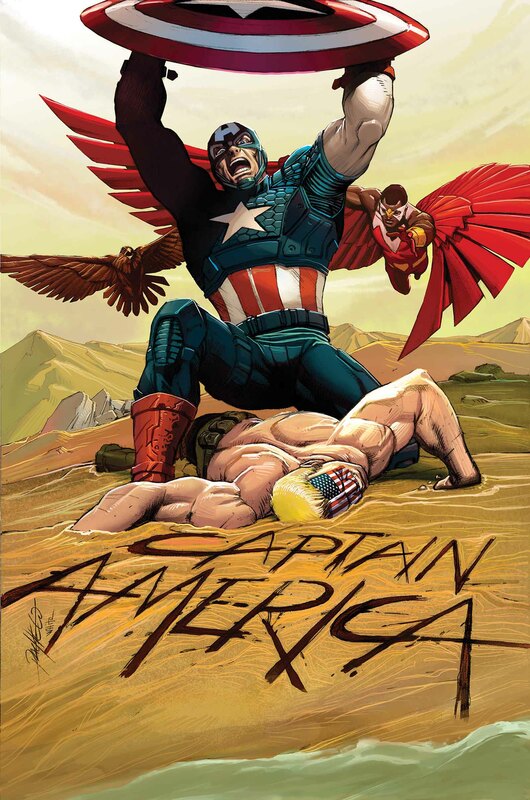 Cap doesn’t even meet Nuke for nearly half of the book, and when he does their fight is ridiculously anticlimactic. 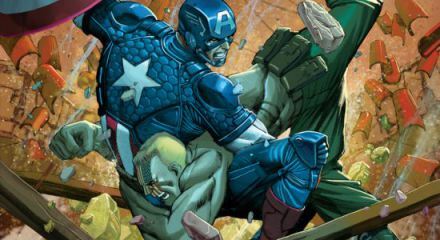 The overblown robot vs. giant Cap fight in Captain America: Reborn wasn’t as BS as Cap vs. Nuke was. So there’s that. My problem overall with the book is that it’s both treading old ground and going in a new direction, and both simultaneous actions are at odds with each other. 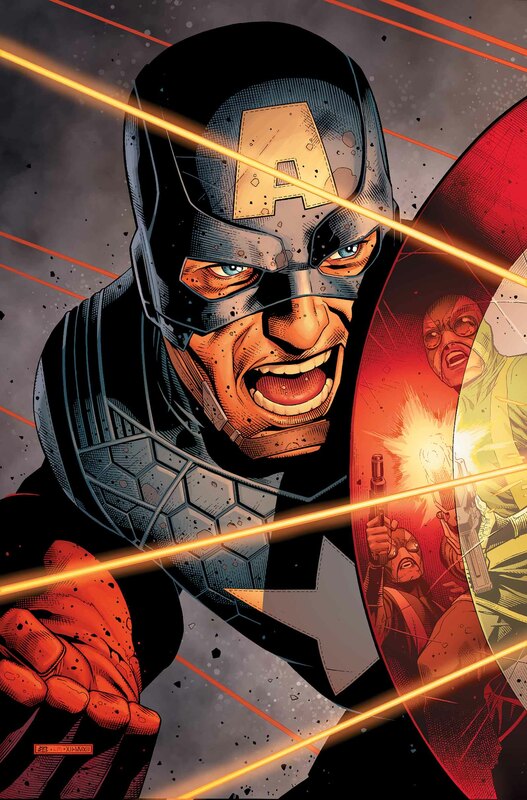 As noted above Cap’s trying to adjust to life in a displaced world, which has practically been the character’s hallmark since he joined the Avengers in 1963, but he’s also surging forward with his own ideals and trumpeting his idealism as a standard we should look up to (the latter used egregiously during a final conversation with Nuke). He’s lamenting the loss of a loved one (Peggy Carter in ’63, Sharon Carter now) and also possibly moving forward with another (Sharon, now Jet Black Zola). All we need now is for him to meet his end on the steps of a courthouse after a civil war with Thor and we’ve got an almost perfect symmetry. Loose Nuke‘s repetition syndrome also manifests in the titular antagonist; Nuke is a layover from the old Weapon Plus project that gave powers to Cap, Wolverine and a bunch of other killing machines. As such, he’s the pawn of a bigger bad guy that’s defrosted him with his old world values so they can point towards enemy and unleash hell. If you didn’t immediately recognise Nuke’s an old leftover from early American jingoism thanks to that bloody tattoo on his noggin, you probably don’t have a sore face of your own from the facepalming that caused me to undergo when reading it. Old Weapon Plus and Captain America knock-offs returning in present day as murderous fish out of water has been done before. Ed Brubaker’s run did that a lot to great effect, ending with a final issue devoted to that ideal as something both romantic and disastrous. Here, it seems Remender misses the nuanced way these old world relics can be brought back in a tragic manner, their diehard love of America juxtaposed with the complexities of the present day and how both are incongruous. Instead, Remender seems more concerned with heavy-handed, blatant dialogue conversely about how America is frikkin’ awesome (from Nuke) and how America is a wretched hive of scum and villainy (from Nuke’s Asian boss – which also seems quite on the nose). The politics of Loose Nuke are on full display, for better or worse. On that subject, dialogue’s either awful or just there. I had a hard time finding a Best Quote for below, since most of what’s said is either too plain to stand out or far too terrible to warrant remembering. There’s no subtlety to any of this; Cap’s dialogue after going back to his apartment and Guy Fawkes’ing his memorabilia is overly maudlin and contemplative. Nuke’s the Team America theme song with steroids and tight trousers. His Asian master Iron Nail thinks the Yankees are capitalist dogs that deserve the needle (or a bomb, y’know, whatever works). Jet Black is adjusting to life on Earth after stepping from her murderous father’s shadow, but also she’s grumpy at everyone. Characterisations are consistent for the returning players, but the nuance is gone. It’s disappointing, especially since his run on Uncanny X-Force has shown me Remender is quite capable of saying a lot by saying a little, letting either lack of extensive dialogue or combination of the written with the visual tell the story more than overlong jingoist exposition ever could. The only area Loose Nuke isn’t a disappointment is the artwork. 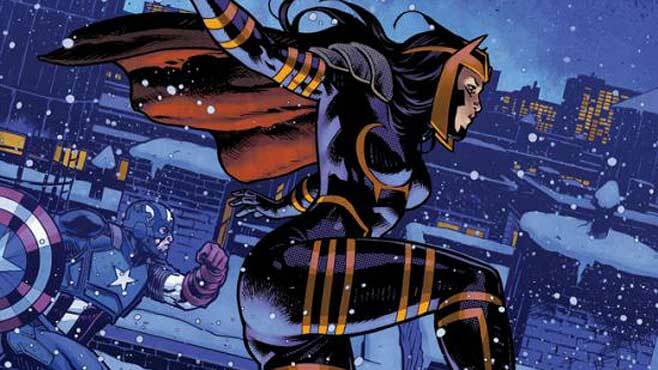 Removing John Romita Jr. in favour of Carlos Pacheco and Nick Klein was a good move, returning to something a little brighter and a lot less messy. The pencils look thicker, facial expressions aren’t all one and the same, and there’s great use of shadowing here and there to aid the visual storytelling without drawing explicit attention to them. Nuke does look absolutely ridiculous, as is intended, and Jet Black should probably put some jeans and a jumper on, but for the most part the two artists and their colourists do a great job. The covers to each issue might even be the most memorable part of the book, since a lot of the plot kinda fades into the white noise. And that is the bigger problem with Loose Nuke at the end of the day: we’ve seen it all before, so it fades in memory a bit. It’s done a little different and the specifics have changed, but as rehashes of old superhero stories go it’s pretty blatant and, more critically, uninteresting. Recycling is par for the course with cape-and-cowl fare, but it feels like we’ve gone a little too far here. Maybe it’s time to throw Cap into the future and see how his 2014 values hold up against the overlords of the Chinese Robot Empire.